Stride length is crucial for faster race times. No stride power, no speed. In a comparison of 10K runner’s race results, those who finished fastest often had also the fastest 100m sprint times. While it’s not enough to excel over long-distances with a powerful stride alone, it’s a vital component for faster race results at all endurance events. In this article, you will learn how to improve it. In my last article, I have outlined the importance of cadence (stride frequency) and its connection to running economy. But cadence can only be improved so much. What really distinguishes front-pack runners from mid-pack runners is stride length. Elite runners can cover more than 2 meters per stride at shorter long-distance races. This requires power, posture, and range of motion. Power is crucial as running is by definition a power sport. Not only will you need the force to propel your entire bodyweight upward and forward, you will also have to generate that force as quickly as possible. So not just strength but power. The more powerful your muscles, the longer your stride. Of course, this is limited by your capacity to supply energy at a fast rate. Another important variable is good running posture. If a longer stride results in overstriding (landing ahead of your body’s center of gravity) then you’re likely to reduce your running economy. On the other hand, good postural alignment of the upper body, hips, and feet will result in more elastic energy return and consequently improve your stride length and economy. Last but not least, there’s range of motion. If your muscles are tight, then you won’t be able to open up your gait behind your body to accommodate a longer stride. The hip flexors, in particular, are short in many runners due to long periods of sitting at the office or elsewhere. But also the quadriceps muscles, and calf muscles (soleus and gastrocnemius) can inhibit a long stride. One of the best ways to improve your stride length is to join a track session of sprinters. 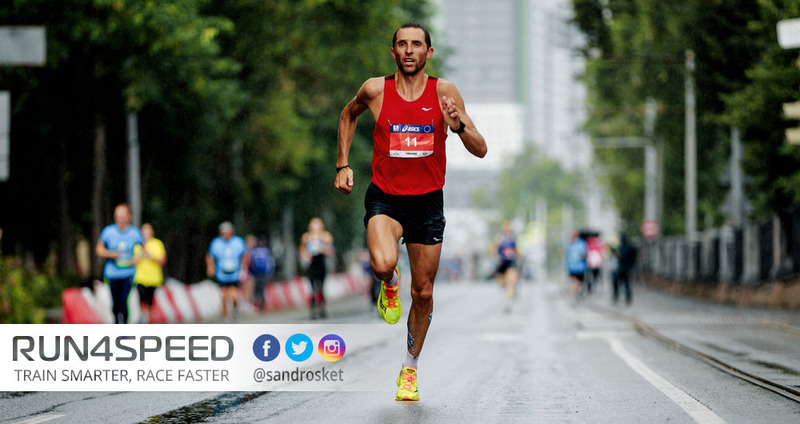 Whereas we distance runners are mostly concerned with energy systems and its variables such as VO2max, lactate threshold, and fatigue resistance, a sprinter’s training revolves around stride length, cadence, and technique. That’s all they focus on and they have the tools to improve it. There’s a lot of debate whether strength training improves running performance at long-distance races. Kenyans don’t do it. But what all elite runners have in common are regular speed sessions with paces ranging from all-out sprint to 1500m race pace. The primary purpose is teaching your body to recruit a maximum of muscle fibers. The more muscles you can recruit, the longer your stride. Speed training also improves your running posture. It is almost impossible to run fast with poor running form. In this case, 800m – 1500m race pace is more specific than all-out sprints. Have a permanent ‘system check’ of the placement of your arms, hips, and landing of your feet. This also teaches your body to relax at speed which improves your running economy in the process. Finally, there’s range of motion. Again, speed training will open up your gait as it resembles in essence dynamic stretching. In this case, fast repeats at 400m pace are most effective. Additionally, incorporate drills after your warm-up at all your running sessions. After training, when your running muscles are still warm, make static stretching a permanent habit. In summary: Stride length hinges on muscular power, running form, and range of motion. Since we long-distance runners spend most of our training mileage below race-pace, our muscles become stiff which results in a shortened stride. The best way to counter it are regular speed sessions, or at the very least, form drills, dynamic stretching before runs, and static stretching after runs.